The Scindia School provides a matrix of intra and inter-School sports activities. 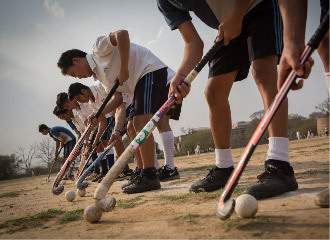 Depending on the season, all boys undergo training in Hockey, Football, Volleyball, Cricket, Athletics, Basketball, Tennis, Squash, Table Tennis, Horse Riding, Skating, Archery, Shooting and Swimming according to their inclination. Our Cross Country Race is a much awaited event. An ‘early rise’ fitness programme of scientifically planned table of exercises and yoga keeps the boys ‘healthy, wealthy and wise’! Our students regularly represent the IPSC and CBSE teams at the National School Games. The boys train under the guidance of Resident Coaches available for all games. Many national level sportsmen have emerged from the School grounds and Swimming Pool. Apart from outdoor sports, the students are encouraged to play cerebral games like Chess. Adventure Sports, such as white water rafting, trekking, rock climbing and mountaineering, are regular features of the School and a lifetime experience for the students. The annual mountaineering trip to Himalayas instills the spirit which stays with our students for the rest of their lives. The campus within the Fort environs itself has inspired professional coaching in rock-climbing. 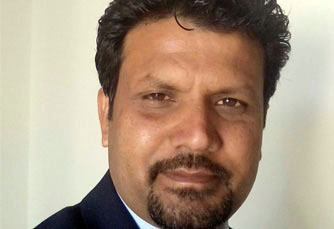 The Director of Sports Mr Naman Saraswat joined the School in the year 2015 with rich experience and many ideas for revitalising Sports. He is a Post graduate in English and Physical Education. He has also done M. Phil. and is UGC-NET qualified. He is presently pursuing research along with working on projects related to sports, fitness, health and Yoga. Adding more sheen to his persona are the numerous accolades he has won in a wide range of sports. He has played National level tournaments in Squash and enjoys playing Tennis, Badminton, T.T, Golf, Swimming and Billiards. He believes that living life to its fullest is the most beautiful way and is the mantra for experiencing the sublimity of life. Fervour for sports is his biggest strength and he constantly motivates and encourages students to be true sportsmen. Under his able guidance, the students are able to enjoy diverse sporting experiences from the most agile and quickest pursuits of games to the state of absolute experience of Yoga and human consciousness.